What is a North Carolina Living Will? North Carolina Living Will: What Is It? A North Carolina living will is usually referred to as an advance directive. The purpose of completing a North Carolina living will is to document your desires related to medical care. 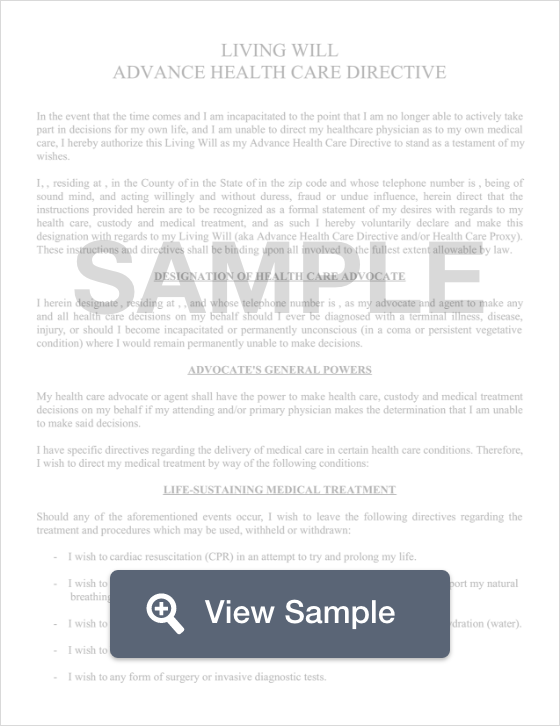 The document is used if you're unable to make your own medical decisions for any reason. A North Carolina living will is also used to name a healthcare agent. Your healthcare agent will make medical decisions for you. This person must be over 18 years old and they cannot be providing medical care for you in exchange for compensation of some kind. In North Carolina, a living will must be signed by two witnesses and be notarized. There are specific laws in North Carolina that explain who can and cannot sign a living will as a witness. § 90-320 through § 90-323: North Carolina lw does not authorize any form of euthanasia, mercy killing, suicide, or assisted suicide. Doctors are required to follow the desires expressed by the patient by this document provided that none of the desires break North Carolina law. Future healthcare decisions aren’t the only ones that must be made. Creating a North Carolina last will and testament can help you express all of your wishes outside of the healthcare realm.